At least you're progressing towards completion. I admire that. I just managed to get the 56 out for a ride yesterday. Had a nice ride though! Well, here are some pics of progress. Wet sanding my way around the car. Still have to adjust more on the front fenders. Drivers side low, passenger high and the left/right isn't correct yet either. :mad: It's really starting to look like something and I'm getting anxious to paint. Still, taking my time is better. That car is so cool! Is it a good idea though to wet sand the primer? I thought the primer was supposed to have some grit to it so the top coats stuck better? If you make it too smooth then there is nothing for the paint to stick to. followed by a wet 400. I follow up with 2 lights coats of PPG sealer before color. Makes for a nice smooth substrate for the color and clear coats. I am wet sanding with 500grit. I cannot feel the imperfections still needing repair without the water and sanding. I've handled too many hot castings over the years. I have some more repairs to do here and there, especially on the front driver fender. 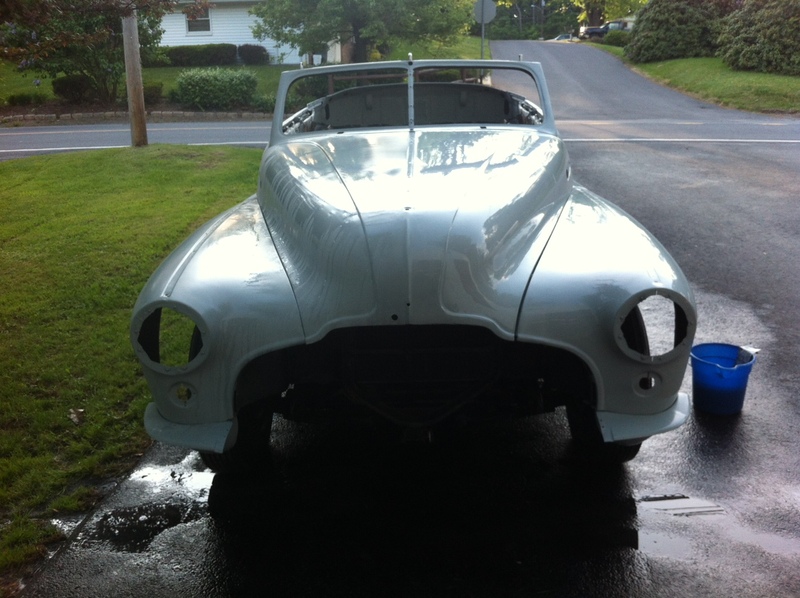 Will probably pull the hood off tonight after sanding other half so I can work on the fender alignment some more. Thanks for all of the kind words guys! Might want to make sure you seal the primer, Matt. ...and yes, it looks really good so far! I will be using an epoxy sealcoat to prevent anything from bleeding through. Ppg is the paint of choice, so their epoxy will be the first thing sprayed. Nice to see it looking like car again, keep up the good work! Hood is back off of the car. Worked more on the front fender alignment. I am getting closer!! I hope that tomorrow I can finish the front end sheet metal alignment and bolt everything tight. More sheet metal persuasion is to be had on the front drivers fender, one of the short pontoon extensions behind the drivers door, the fender skirts and interior garnish. If I really settle down and get-r-done, I would hope I can lay all of that to bed before the end of the weekend. If that is the case, I'll go pick my final color and buy the epoxy primer. I Matt, sorry for the camping. What color have you finaly choose? MATT, you said earlier that you'll probably go with dark blue, to complement your bright red interior. Lovin' it! 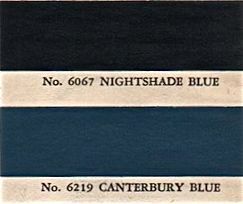 For '47, Buick offered Nightshade Blue and Canterbury Blue. Both are metallics (their paint codes include "luminescence"), so they might look a lot better in reality than on the attached colour chart. Are you thinking of one of these or do you have something more creative in mind? 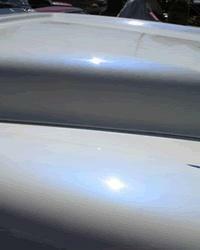 In late 47', Buick offered a blue paint called "regency blue" which is also a metallic color. It is very dark. Tha ppg paint code is 10417 and is not a current paint code. 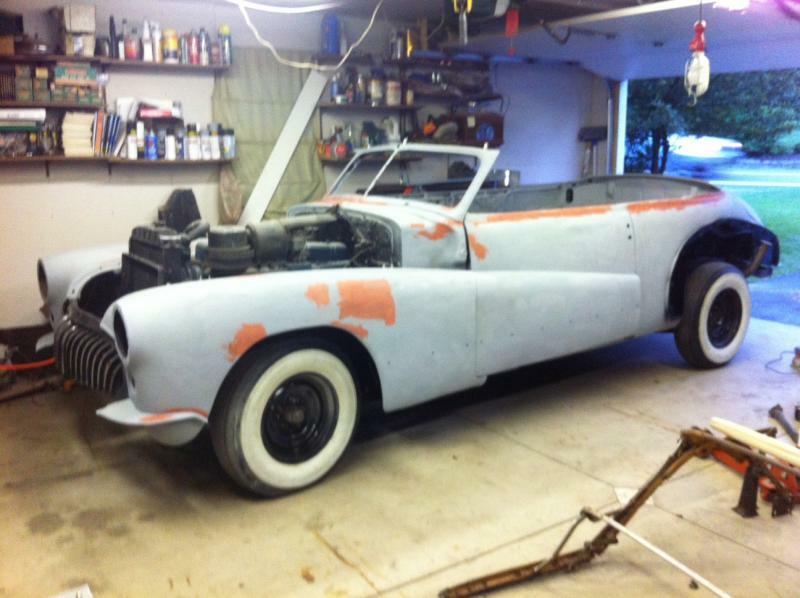 With the help of another member and 47 RM convertible owner, we have found a paint code that is close. Now to my current situation, I'm not the best bodyman in the world. 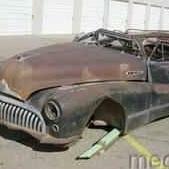 On top of this, cars in the 40's had wavy panels from the factory. So, I've been checking out a white paint with red pearl in the clear coat. The body lines are pretty straight and door gaps are fair. The lighter color will help hide the imperfections in the panels. 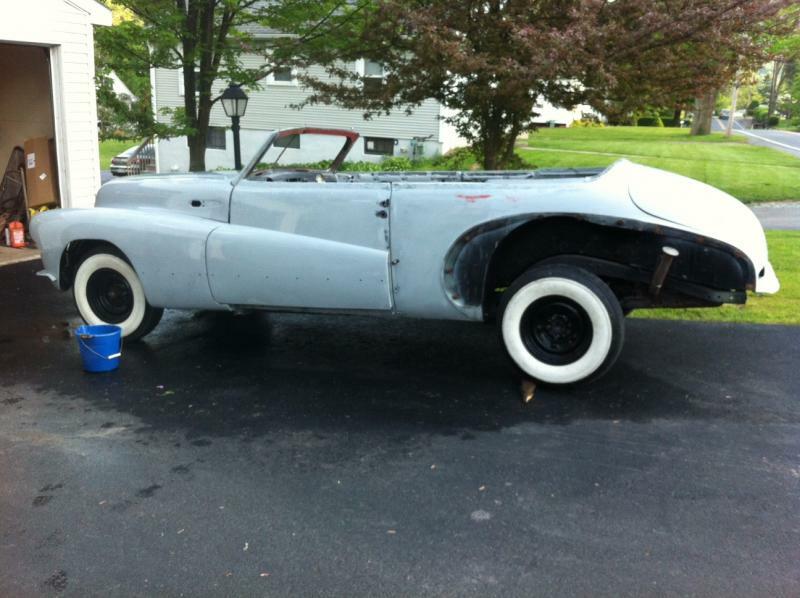 Remember, I am going to drive the hell out of this car and enter it in local car shows. It is not a 400 point car, nor will it ever be while in my possession. Tonight I managed to finish up the front end sheet metal alignment. I am quite happy. Just one more tweak on the passenger side tomorrow. I also found a few more dents and persuaded on them with hammer and dolly. Tomorrow should be skim coats of filler on a few spots and some more sanding and filler primer. My opinion is always that its' your car, and you can do what you like. With bodywork I've found the real talent and skill is patience to so the sanding/priming/sanding over and over till its' perfect. Just do the best you can, paint the car in a colour you like, and have fun! If you are looking for a dark blue, and would consider a non-original color, then BMW Mini-Cooper has a great choice, IMO. Just offering food for thought. Can't imagine what that looks like. Does it pick up red highlights in the curves? 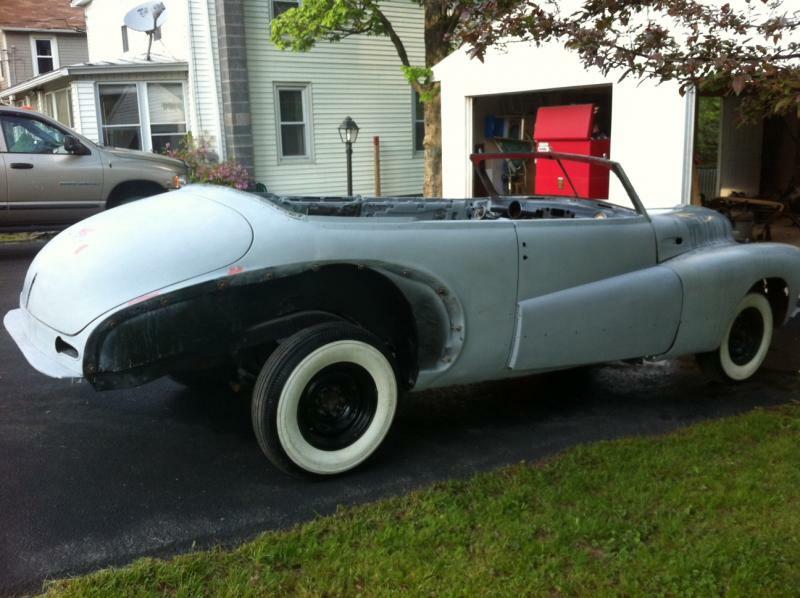 Your gorgeous Buick is one honkin' collection of curves, so that could be really stunning. Can you suggest examples of modern cars with this sort of coloured pearl over a light base colour? Went Googlin'. Here's a blue pearl over white. Wow. Go out and play, Matt! That is what I am suspecting will happen if I decide to do the red pearl in the clearcoat over white. Today was a busy, busy day. I tweaked a lot on the passenger side and now I think the drivers side needs more tweaking. When will this end!!!!!!!!!??????? I was able to sand out the drivers fender today and it's primered again with several coats of filler primer. I decided to try putting the grill frame back on to help with aligning the front end. I get excited every time that I put in a full day on the car. I was out there almost 6 hours. I worked on door gaps also by shimming body mounts. Getting closer and closer and I think that it might even be helping the fender to door alignments. Probably no work on the car tomorrow as we are going to try to beat the heat at Hershey park tomorrow. Only 2 hours away and it is a great time for the kids. Hey, I'm a kid at heart. I went around the car and applied the fun red stuff on all of the scratches I could find! I would hope that I can finish the bodywork tomorrow and sometime this week get to the paint gettin' place for the epoxy primer for sealing all of this garbage up. I didn't even roll the car outta the garage today! So wore out I only took one picture. Hope everyone had a great weekend! I know I did!